How Does Jogging in Place Compare to Jogging? Roger Cahill has been a health and fitness professional since 2004. Cahill holds a Bachelor of Science in kinesiology from Arizona State University. He also has excelled as a professional runner and was a former Sun Devil Student Athlete. Cahill has earned his American Council of Exercise personal training certification and has trained many professional athletes. If you lack a treadmill and the weather is lousy, jogging in place might be your only option if you want to run that day. While jogging in place burns calories and increases your heart rate, you miss out on some of the benefits gained by jogging outside or on a treadmill. The Centers for Disease Control and Prevention suggests completing 150 minutes of aerobic activity each week to maintain your current weight. If you want to lose weight, you can increase your exercise time. 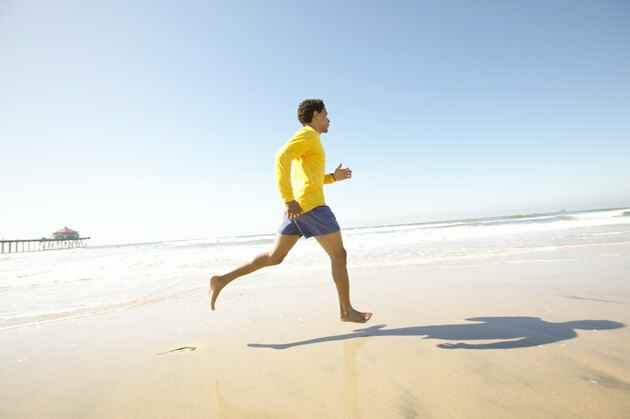 Jogging in place might be the most convenient way for you to exercise because it can be done anytime and anywhere. But while it might be more convenient, you can reach your fitness or weight-loss goals quicker by jogging outside. The caloric burn of jogging in place is far less than jogging outside. When you jog outside, you are able to change your terrain, which can increase the demands placed on your body. For example, running uphill is more strenuous than running on a flat surface. A 150-pound person burns 272 calories in 30 minutes jogging in place, while jogging outside for 30 minutes at an eight-minute-per-mile pace burns 425 calories. Whether jogging in place or outdoors, you can increase your intensity during exercise. When you jog in place, increase your efforts by bringing your knees higher to your chest and using weights for resistance. When jogging outside, increase your stride length, speed and even your incline. While both are effective when it comes to intensifying your workout, modifying your outdoor run in this way places a greater demand on your body than lifting your knees higher. Both activities work the major muscles of your body. Jogging in place and jogging outdoors engages your quadriceps, hamstrings, glutes and calves. Your core is also worked in both exercises and stabilizes your body during movement. The upper body is engaged as you swing your arms. You may engage more upper-body muscles jogging outdoors because you must use your arms to propel your body forward. When you jog in place, you depend less on your upper body for momentum. How Many Calories Does Jogging in Place Burn? Can Speed Walking Slim Your Legs?